BBHavanese - UPDATE 3/12/18: WE HAVE PUPPIES!!! WE HAVE PUPPIES!!! If interested, please contact us as soon as possible!!! WE JUST LOVE OUR PUPPIES!!! We have 1 Female and 1 Males, born March 2nd! These will be able to go to their homes first week of May. Please no holds without deposit. Contact Dawn @ 615-533-0488 or bbhavanese@yahoo.com! Visits will begin 1st part of April 2018. Will be happy to send pictures, etc. Visit is NOT required to reserve puppy - can do with pictures, etc. We do not ship puppies in cargo. We do offer delivery at cost (no extra costs added, unless going to other country or off coast of the U.S., requiring quarantine boarding, etc). Our puppies are very alert, happy , lovingly spoiled, & are in our home.Parents are on premises & eyes cerf'd. We breed to promote quality in the breed, not quantity. $300 non-ref deposit to reserve.Call 615-533-0488 for more info. Deposits are now being taken to hold your pick for an upcoming litter! (Only in certain circumstances will I ship my pups, and prefer to deliver in person, flying there and back with the puppy in the cabin with me, or of course you can come and pick up as well.) Price is comparable to shipping in cargo and much, much safer!.All my babies are well socialized, raised in our home.Color backgrounds include: Cream, champagne, Irish Pied, black, sable, chocolate and more.They ARE like you see in the Shows! We allow them to go to their new homes at 8-10 weeks, but determine that individually, based on the pup. Please call with any questions: 615-533-0488 (Dawn). Our Havanese are of the Kimbriel line, one of the 1st and best in the US, as well as 2 other champion lines. They have Champions in their bloodline and are the epitome of the Havanese breed. Our Choco's (of the famous Maxanita line) mother AND father are CHAMPIONS! His brother, whom the breeder kept, is showing very well and is winning in the Havanese shows! His brother is winning all, beating out the number 2 dog! Whether for pet or show, our Havanese are sure to please. 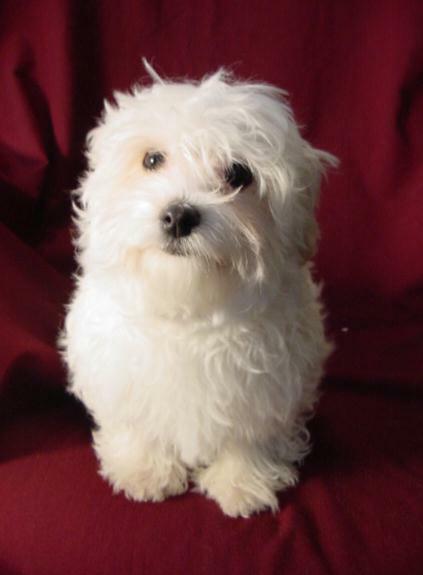 They are raised in our home with our family and are very well socialized around adults, children, and other Havanese. We have the parents as well. We are proud to only breed for quality rather than quantity. They are registered with the AKC, dew claws are removed, they are up to date on their vaccinations, and are microchipped for their safety. We have all colors in our lines, including chocolate. We provide a 2 year health guarantee and our parents’ eyes are checked by our Opthamologist Vetrinarian. You will find that there is a difference in Havanese lines, and you may find a puppy at a lesser cost, but remember, you also get what you pay for. We pride ourselves on raising very healthy, happy babies. Please contact us anytime with questions! Above is our Fluffy's father, whom he looks just like. All white and "fluffy"! Our "Treasure", he was the boy in this litter. He has a predominantly black head with a little black on his back. He is next to smallest of the litter, and should be around 9 pounds full grown. He loves to play, but also loves to cuddle! 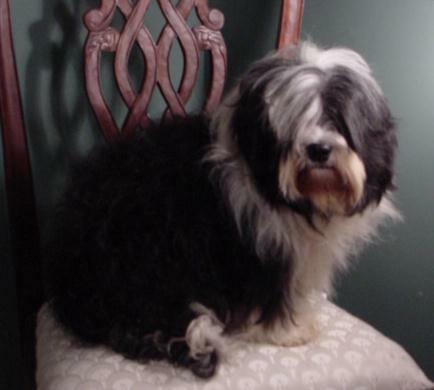 He is very well socialized, and loves people of all ages and other Havanese. He will do well in any hoome, with or without other pets. He has been placed and has a wonderful family to love! Little Pretty Brown Eyes is Irish Pied, having a black head and back, white feet, belly, and tip of tail. "GIDGET" IS NOW IN HER FOREVER HOME WITH HER NEW MOM AND DAD IN WEST TN. Miss Moving On is Irish Pied, having a predominantly black head and back, white feet, belly, and tip of tail. "ATHENA GRACE" IS NOW IN HER FOREVER HOME WITH HER NEW MOM AND DAD IN MIDDLE TN, AND ENJOYS VISITS FROM ANOTHER FAMILY MEMBER'S YORKIE. Prices of our puppies do vary, and depend on what your intentions are for your new family member (Show / Breed /Full Registration are more costly than Pet/Ltd Registration), coloring, etc. Females are more expensive, and males make wonderful pets as well, and neutering helps their "ways". They are very loving, like the females, perhaps with a little less moodiness! We prefer to place our puppies in Pet Registry homes, and require extensive information on the new homes. If you would like to reserve a puppy, please call (615-533-0488) or email us. Thanks! Copyright 2010 BBHavanese. All rights reserved.